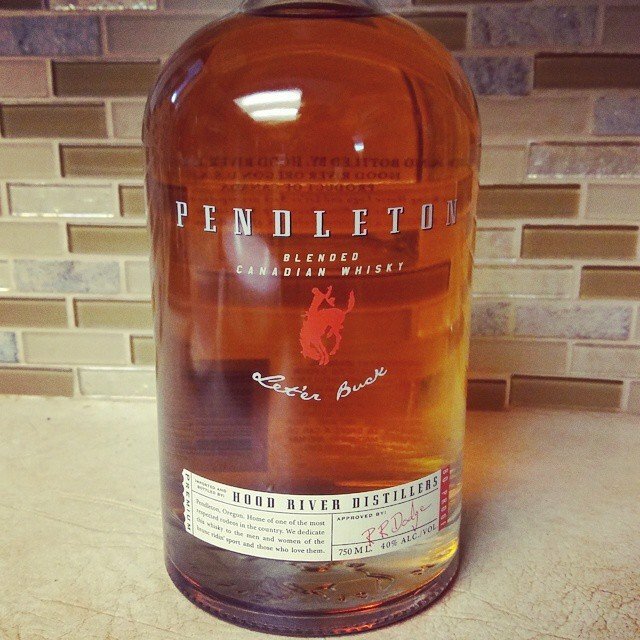 Pendleton is a blended Canadian Whisky is distilled in Canada but bottled and distributed out of Hood River, Oregon. They’re the largest importer of distilled liqour in the Pacific Northwest. Although its Canadian, its affectionately known as the Cowboy Whisky. It launched in 2003 and it’s grown quickly since then. It’s the official whisky of the Pendleton Round Up, which is a distinguished rodeo. It’s named after the rodeo. To be called Canadian whisky it must be mashed, distilled, and aged for a minimum of three years in Canada. Pendleton Blended Canadian Whisky is aged 10 years in American Oak Barrels. It’s technically a rye whiskey, but it doesn’t meet the American standards for rye. A bottle is less than $30. It has a lighter body, but a full flavor. It has a nice, sweet aroma. It tastes like brown sugar, vanilla, caramel, with a little bit of cinnamon spice. It’s a great whisky for sipping, let it breath a little bit first. To open up the flavor, add a single cube and enjoy. It’s a great alternative to Crown Royal. If you want it in cocktail form, try making an Old Fashioned with it. Or go simple and have it with soda water and a dash of bitters.